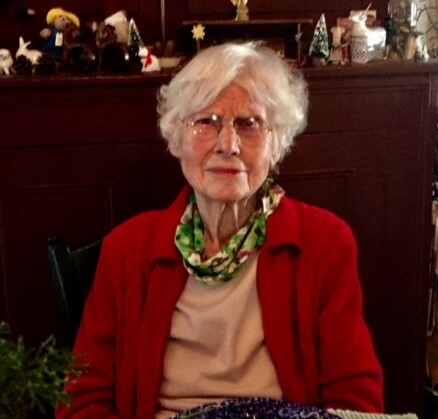 Florence E. Mercer, 101, of Hancock, passed away peacefully at her home on August 24, 2018. She was born in Waterville, Maine on September 28, 1916, the daughter of Fred Conant and Mary (Walton) Conant. Florence is survived by her 2 children, Philip James Mercer of Ashland, MA, and his wife Linda; and Karen Dale Nigh and her husband, Grant, who resided with Florence in Hancock, NH; her grandchildren; Jonathan, Stephanie, David, Rebekah, Noelle, Heather, Alison and Joey; and her great-grandchildren; Jewel, Noah, Sophie, Mollie-Kate, Cody, Gavin, Haley, Sebastian, Levi, and Luca. She was predeceased by her husband James W. Mercer, her beloved grandson Stephen, and her siblings Stan, Ted, Russell, Roger, and Betty. Florence was a librarian for Framingham Public Library for 15 years, retiring in 1975. She was a writer, editor, and pen-pal to many. Her hobbies included story writing, crosswords, playing scrabble, jewelry-making, reading, and playing piano. She was a wonderful listener and cared about others deeply, and always gave a listening ear to whoever would sit and talk. Florence poured her life into serving others through ministries, church activities and volunteering. She was instrumental in organizing a Baptist church in Framingham, now Chapel of the Cross, in Westborough, MA. She served in youth ministries for many years as teacher, writer, and secretary for “Child Evangelism” and “Pastors in Framingham”. She also served with “Straight Ahead Ministries”, a prison ministry for teens, writing letters to inmates into her late 80s. She also volunteered for the Red Cross. After spending her childhood in several New England towns, Florence moved to New York City as a teen. She attended George Washington High School, and the School of Journalism in New York CIty. She enjoyed athletic activities. She was a champion at badminton and enjoyed tennis and swimming. After marrying James W. Mercer in 1940 they moved to Worcester, MA. In 1955, James and Florence bought a house at 64 Maple Street, Framingham, MA. Their home was a lively place and a second home to many family members, boarders, and friends. In 1999, Florence began a new chapter in her life when she moved to Hancock, New Hampshire . During her last 20 years, she had many adventures including traveling to Canada, horseback riding, shooting, ATV riding, boating, and enjoying holidays with friends and family. She was healthy and sharp as a whip until the end. Her faith in Jesus carried her through her last days with confidence and peace in her heart. A memorial service will be held on Sunday, September 2nd, 2018, at 3 PM at Jaffrey Bible Church, 133 Turnpike Road, Jaffrey, NH. In lieu of flowers, memorial contributions may be made in Florence’s name to: Straight Ahead Ministries at 791 Main Street, Worcester, MA, 01610 or online at Straightahead.org; or Jaffrey Bible Church, 133 Turnpike Rd, Jaffrey, NH 03452. .